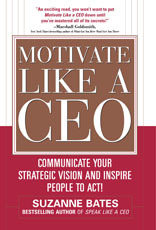 smartbooks.com Feature: Motivate Like a CEO: Communicate Your Strategic Vision and Inspire People to Act! Secrets for communicating strategy in a way that motivates others and drives results. In this follow-up to Speak Like a CEO, Suzanne Bates helps leaders at every level become a "force of influence" within their organizations, generating excitement and instilling accountability that culminates in superior results. The author offers key advice on how to articulate a vision in a way that motivates people to act.